Bitcoin plunged below $8,000 on Friday, a whopping 60 percent drop from its high less than two months ago, before rebounding. After skyrocketing to a record $19,000 per bitcoin in December, the digital asset has endured a series of steep drops, drastic for even the notoriously volatile crypto trade. Smaller cryptocurrencies were down, too, with Ethereum off more than 25 percent, Ripple down 30 percent and Bitcoin Cash down 24 percent at some points. The cryptocurrency markets were joined by the U.S. stock market. The Dow Jones Industrial Average dropped more than 650 points on Friday, finishing its worst week in two years. Those people who held on to their bitcoins enjoyed some relief, though, with bitcoin's price rebounding to trade around $8,700 as of Friday afternoon. But the broader decline has stoked fears that bitcoin skeptics were right to call its rise a bubble. If bitcoin is a modern-day "tulip mania," the bloom appears to be off the rose. At least, that is, if you bought after late November, when bitcoin's rally turned it from a fringe technology into a hotly debated commodity. "Anyone who bought before Thanksgiving is still playing with house money," Nick Colas at DataTrek Research, an analyst who's been covering cryptocurrency for over four years, told NBC News. "Most long-term holders are still OK."
Bitcoin's price is still up more than 760 percent in the past 12 months, with other cryptocurrencies seeing similar increases. But it can't be missed that over $100 billion has been wiped off the torrid crypto market in the past 24 hours. The decline has erased gains for newcomers who had bet their pocket change, credit card lines or, in some cases, second mortgages on one of the most-hyped investments in decades. Websites and apps, such as the popular Coinbase, made it accessible to buy bitcoin on a smartphone and credit card while waiting in line at the supermarket, turning everyone from schoolbus drivers and ironworkers to students and homemakers into amateur crypto day traders. Because crypto can be bought in fractional amounts, regular people can buy in for just a few bucks. Experts cite a "perfect storm" of factors now driving down the price of the bitcoin. Regulators are starting to make noise as the crypto craze and the eye-popping gains, over 1,000 percent for some coins, have caught their attention. 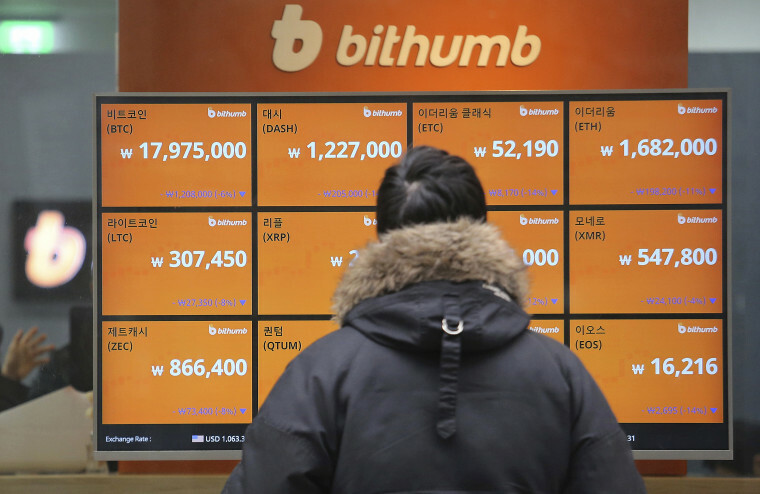 Even small moves from governments can set off a panic, as in South Korea when rumors spread that the government was going to ban cryptocurrency trading entirely. It later turned out that the government will allow such trading to continue, but will prevent people from being able to do so anonymously. On Tuesday, news that U.S. regulators sent subpoenas to the virtual currency exchange Bitfinex and sister company Tether contributed to a 10 percent decline in Bitcoin prices that day, Bloomberg reported. Regulators in other countries, like India, have also added to the spate of reports. For long-term holders, that's just part of the business, as the crypto market's rising popularity draws inevitable attention. "Crypto investors will just have to get used to more critical headlines from regulators," Colas said. And for the past three years a cryptocurrency slump has occurred in January, which some experts attribute to Asian customers pulling money out the market to buy gifts during Chinese New Year. As selling increased, a "buyer strike" contributed to the price declines, Ronnie Moas, founder and director of Standpoint Research, told NBC News. "The rug was pulled out from under bitcoin," Moas said. "There were a lot of people trying to get out, from people who lost a lot of money in the past few weeks who decided they couldn't take it or people who made a lot of money who got in a year ago who wanted to lock in gains before they evaporated." Customers who used a "stop loss" mechanism, which are automated orders to sell when the price falls to certain lows, could have steepened the slide as well. That selling can in turn trigger further automated selling. There's also some question of whether Bitcoin will remain the "coin of the crypto realm" and the one most investors put their cash in. Other currencies, especially Ethereum, have been catching up to Bitcoin's $140 billion market cap, adding further uncertainty and churn. Despite the stomach-churning dips, Moas remains bullish on bitcoin. "It can go to $100,000 and it can go to zero," he said. "If you wait until the coast is clear, you'll have to pay $50,000" in order to buy in. "If you can't deal with the risk, reward and volatility, then put your money in a AAA bond," he said.